استادیار گروه جغرافیا، دانشگاه بیرجند. اقلیم مهم‌ترین عامل در توسعه صنعت توریسم محسوب می‌شود. مسافرت‌های گروهی و دسته‌جمعی با شرایط آب و هوایی پیوند می‌خورد. عامل ارتفاع و اعتدال درجه حرارت به همراه مناسب بودن شکل ظاهری زمین و قابلیت دسترسی آن، از عواملی محسوب می‌شوند که شرایط توریسم را فراهم می‌آورند. شهرستان قاینات با توجه به داشتن زمین‌های زراعی مناسب برای کشت محصول استراتژیک زعفران، واقع شدن در محور ترانزیتی شرق کشور و داشتن آب و هوای نسبتاً معتدل از قابلیت بالایی در جذب گردشگر برخوردار می‌باشد. طرح جامع توریسم زعفران، عنوانی است که به‌صورت جزئی اما دقیق و منطقی در مناطقی که این محصول کشت می‌شود، مورد بررسی قرار می‌گیرد و برای آن شناسنامه توریستی تهیه می‌شود. در این پژوهش با استفاده از شاخص‌های زیست اقلیم مانند سختی هوا، تنش گرمایی، قدرت خنک‌کنندگی باد در دوره آماری 22 ساله هواشناسی ایستگاه قاین و در محیط نرم‌افزار Bioklima به بررسی آسایش اقلیمی شهرستان قاینات پرداخته شد. نتایج نشان داد که این شهرستان در ماه‌های اول بهار و پاییز دارای قابلیت مناسبی ازلحاظ شرایط آب و هوایی برای تفریح و سفر به این شهر را دارد، به‌ویژه که اوایل پاییز فصل برداشت زعفران در این شهرستان بوده و می‌تواند مناظر زیبایی را برای جذب مسافران به وجود بیاورد؛ بنابراین تلفیق دو عامل اعتدال آب و هوا و برداشت محصول (زعفران) با توجه به ایجاد مناظر زیبا و منحصر به ‌فرد می‌تواند شرایط را جهت توسعه توریسم کشاورزی در قاینات فراهم نماید. Climate is an important factor in the development of industrial tourism. The group travels to heal with climate. Elevation, moderate temperature and suitability of landscape are factors that are required to consider as conditions for tourism. There are some benefit such as center of cultivating barberry and saffron, a moderate climate and being located in transportation axis of east of Iran in the city of Ghaen that make it have a in high potential to absorb tourists. A review of climate convenience with bioclimatic indices such as W-strain and W_Sens shows that the first month of the spring and autumn in Ghaen, the climate is suitable for travelling, especially for the beautiful landscapes of barberry and saffron. Therefore, combining the moderate climatic and the beautiful landscapes of barberry and saffron can provide good conditions for agriculture tourism. Saffron tourism master span is the accurate and reasonable title in areas where the crop is grown, and studied. It is also a tourist profile. In this study, using the ecological indicators of climate such as severe weather, heat stress, cooling power of wind during the 22 years in Ghaen station. Bioklima software was used to investigate the climate comfort. This city provides such a situation that in the first months of spring and autumn, weather conditions are fit for tourists and for recreation and travel. Especially, the early autumn harvest of saffron in the city plus the beautiful scenery can attract travelers. So, combining the two factors of moderate climate and harvest of Saffron work hand in hand to attract tourism. Therefore, these two factors combined (a moderate climate and harvesting saffron) create beautiful scenes and can provide conditions for the development of agricultural tourism. Ahadnejad, M., Naderi, A., and Sadeqi, E. 2012. Agricultural tourism new review utilization vision of natural attractive. The National Conference on Strategies for Achieving Sustainable Development, Tehran, 14-15 March 2012, p. 97-109. Ahadnejad, M. 2012. Agriculcher tourism, new approach in natural attractive. the First National Conference Methods to Achievements to Sustainable Development, 20 October 2012, p. 23-36. Bariabaghuyi, B. 2008. Check investigate climatic factors on flowering of saffron. Islamic Azad University, Science and Research Thesis, p. 49-63. (In Persian with English Summary). Besancenot, J. 2000. Bioclimatological rating of cities and resorts in South Africa according to the climate index. International Journal of Climatology 35 (20): 1403. Butler, R. 2002. The concept of a tourist area cycle of evolution: Implications for management of resources. Canadian Geographer 24 (1): 5–12. Dadkhah, M. 2002. Iranian Saffron Undiscovered Gem, Published in Chaos, Tehran the history and geography of the City Cain, Tehran. p. 41-57. (In Persian with English Summary). Eduardo. P. 2006. Agro tourism sustainable tourism and ultra-peripheral areas: the case of Canary Islands. Review of Cultural Tourism (4): 85-97. Freitas, R. 2003. Tourism climatology: evaluating environmental information for decision making and business planning in the recreation and tourism sector. International Journal Biometeorology (48): 45–54. Gomez, M. 2005. Weather, climate and tourism, a geographical perspective. Annual of Tourism Research (32): 571-591. Grigorieva, E., and Matzarakis, A. 2010. Application of physiologically equivalent temperature for assessment of extreme climate regions at the russian far east. The Proceeding of 7th Conference on Bio Meteorology. Institute University of Freiburg (20): 386-391. Khatibi, M., and Fakhimzadeh, H. 2007. Feasibility study of agricultural tourism in South Khorasan Province Using AHP. Conference, Agriculture, National Production with a Focus on Land Use Planning, Qom, 27-28 February 2013, p. 4–17. Koocheki, A. 1998. Ecological Impact of Climate Change. Press University Jahad, Mashhad. Koocheki, A. 2009. Evaluate the performance of saffron for drug crops. 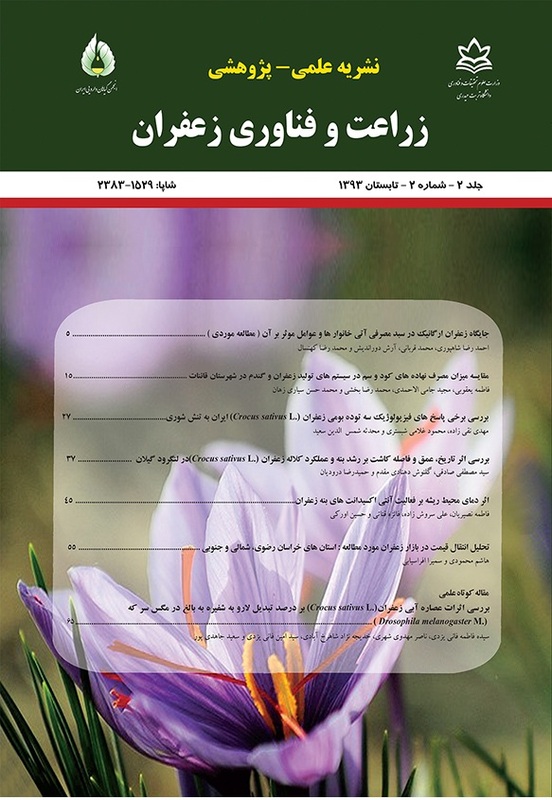 Iranian Journal of Agricultural Research 7 (1): 175. (In Persian with English Summary). Lee, W. 2006. Agro-tourism as a rural development strategy in Korea. Journal of Rural Development 29 (9): 67-83. Management and Planning Organization of South Khorasan Province. 2013. Initial reports identified the Cities of the province. Available at Web site http://www.sk-portal.ir/index.php,option. Management and Planning Organization of South Khorasan. 2011. Statistical year book of South Khorasan province. Available at Web site http://www.sk-b.ir/index.php. Matzarakis, A. 2001. Climate and bioclimatic information for tourism in Greece. International Society of Biometeorology (5): 171-183. Meteorology Organization of South Khorasan. 2013. Synoptic Station Data of Qaenat. Available at Web site http://skhmet.ir. Molina, R., Valero, M., Navarro, Y., Guardiola, J., and García-Luis, A. 2005. Temperature effects on flower formation in saffron (Crocus sativus). Scientia Horticulturae Science (103): 361-379. Plessner, O., and Ziv, M. 1990. Corn production in saffron crocus. Department of Agricultural Botany 49 (8) 1257–1272. Rajabi, N. 2005. Geography and history of Qaenat. Shahrashoob publisher, Tehran. Sharply, S., and Richard, b. 2001. Rural tourism. Press Secretary, First Edition, London. Shirmohammadi, A. 1998. The Tourism Industry without Smoke. Journal of Tourist Magazine (9): 53-72. (In Persian with English Summary). South Khorasan Agricultural Statistical Information System. 2011. Available at Web site http://kj-agrijahad.ir/dbagri/baghebani.php. Teppakorn, N., Songkhla, F., and Buncha, S. 2013. Interactions between agro-tourism and local agricultural resources management: a case study of agro-tourism destinations in Chang Klang district, Southern Thailand. Discourse Journal of Agriculture and Food Sciences (3): 54-67. Victor, T. 2009. Geographic factors affecting tourism in Zambia, Arizona State University, USA. Annals of Tourism Research (15): 487-503.